I hope that everyone had a wonderful St. Patricks Day and there wasn't too much pinching! Today we'll be sharing a beautiful layout that Michelle created using Authentique, the same line she used for her Lollipop Centerpiece. Let's take a look! Since I was given Authentique's "Miracle Girl" collection to work with this month, I really wanted to utilize all the cute baby die cuts and stickers that are included in the kit. I decided to create a baby girl layout and luckily my little niece was willing to pose with me in matching animal ears jackets. Last month I made a wall hanging for her using this kit, but this time I wanted to make something I could keep. There are so many pieces in the kit, that I've made 5 projects already and I still have a lot of supplies left. You've seem two of the five now, all will be revealed in time. Featured Collection: Authentique's "Miracle Girl"
One component of our assignment this month was to use handmade embellishments in our projects. I made a clothesline of baby clothes by first setting two eyelets on my layout and running some pink string through the holes. I stamped the same image twice onto two different patterned papers and paper pieced them together to create different colors on the same item of clothing. I also cut out the safety pins from a die cut in the kit and glued it on top of the onesie to look like it is holding the onesie onto the clothesline. I added some Glossy Accents to make it look like an epoxy sticker. For the title, I used a die cut as the main title block. I added a smaller die cut to accent it. I used some alphabet stickers for the subtitle. To match my subtitle of "10 finger 10 toes", I used my pinkie finger and stamped along one side of the title. 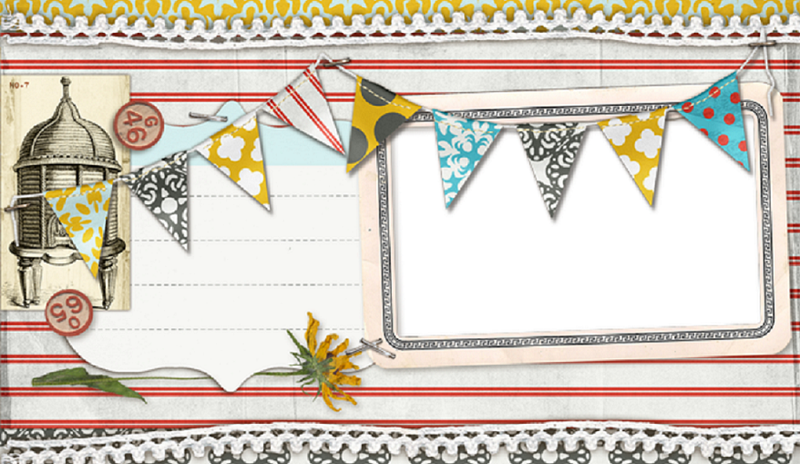 It looks like part of the vintage paper, but it is a subtle way to embellish a page and further play with the theme. Thanks so much for stoppin' by today! Thanks, Michelle - I love this layout. 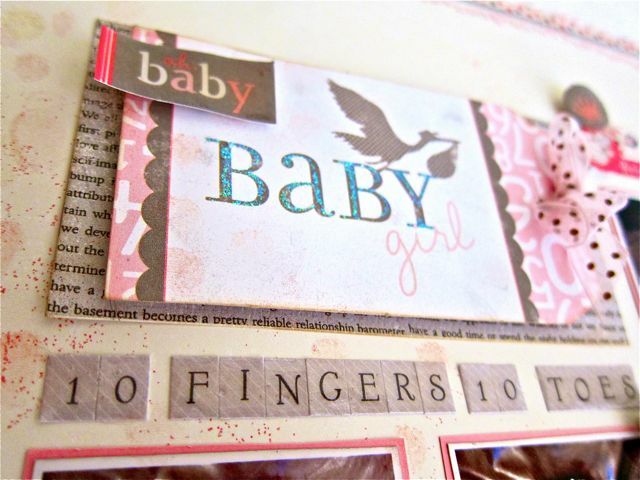 I love the softness, the colors, the photos... but I really think that the stamped embellishments turned out amazing. They really do look like something that you would purchase! Thanks for checking in today, we'll be back again tomorrow with another project from Debbie!